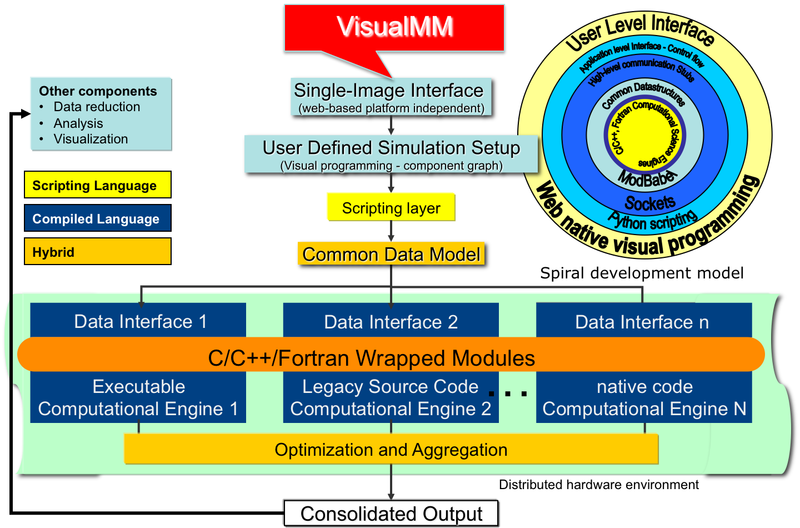 CMDF is a single-image materials and process modeling and simulation framework, integrated from different tools and engines, intended to allow hierarchical traversal between different length and time scales (first-principles quantum-mechanic <-> continuum mechanics), and between disparate paradigms (i.e. alternate methods) per scale. Its goal is to enable de novo design of new or optimized materials with improved performance and to enable first-principles predictive science in chemistry, physics and biology. CMDF uses the Python programming language to control the computational flow between disparate processing cores written in compiled languages (C/C++/Fortran) that carry out physicochemical calculations for multiscale/multiparadigm under a unified data model. Recently, CMDF's software architecture was re-modeled and re-specified using the UML (Unified Modeling Language) in order to enhance its overall flexibility and run-time performance, as well as to guarantee a highly-decoupled, component based, development/maintenance process - we use a spiral software methodology with short-term incremental cascade-type intervals (that include unit and system testing). Observations Funding required in order to develop and deploy a full-blown integrated service for a Materials Science digital library, using CMDF engines integrated under a web-native visual framework. The complexities of physical phenomena, and the growing number of new modeling paradigms for exploring various time and length-scales, limit the use of current modeling programs to experts. Specialized courses, with steep learning curves, enable students and seasoned researchers to make use of these tools. Yet, the complexity is necessary to realistically model many processes or materials with sufficient completeness and resolution. Enabling computations in a user-friendly and computer-language agnostic fashion to expand the user base remains a great challenge. This is particularly true for both performing scientific research and for training or teaching complex problems in the natural sciences. We propose a new scalable web-based framework for modeling multi-scale, multi-paradigm phenomena, aimed at enabling a collection of services using the algorithms and theory serviced by the expert. The framework is based on a distributed hybrid data-flow visual modeling and execution engine, which implicitly handles multithreading and concurrent processes over web-services. This framework provides a "single-image" interface that allows a visual specification of complex multiscale, multiparadigm simulations while hiding (with progressive disclosure) most of the programming specifics from the user (see top left figure). 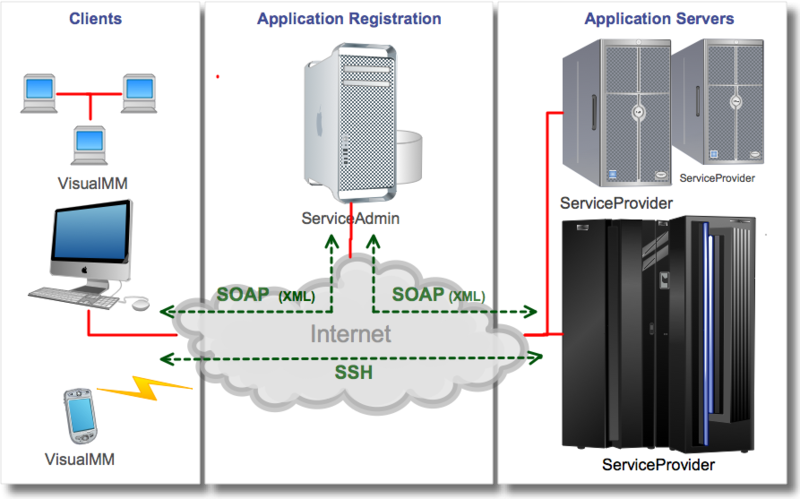 This is ideal for on-line learning and peer-to-peer collaborations since any user would have access to publicly exposed services, distributed over the Internet, registered and enhanced through digital libraries to aggregate community-contributed models and engines for handling complex physical/chemical problems (see top rigth figure). 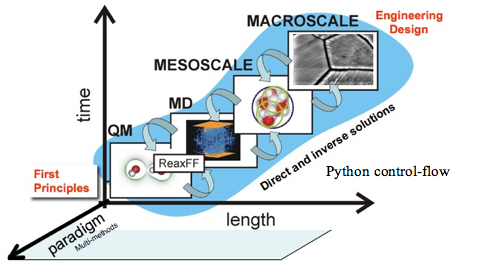 We have developed a preliminary proof-of-concept prototype code-named VisualMM for handling the multiple paradigm components of this framework for molecular level simulations in Material Science; it consists of a Python-based visual programming layer with an underlying web-services layer in SOAP capable of controlling and coupling the computation flow of disparate physics paradigms running over a distributed environment. The components of a network model (graph) can be anything from pure Python code to wrapped compiled (fast) codes from our CMDF framework (refer to the figure to the left). Ongoing tests and validations are being performed with the prototype using quantum mechanics, molecular mechanics and dynamics, and coarse-grain force field-based mesodynamics engines, yet we expect to develop a full-blown framework capable of handling systematic paradigm and scale couplings, accessible from a public digital library such as NSF's NSDL. (C) Materials and Process Simulation Center, Caltech, 2007. Contact: Andres Jaramillo-Botero [ajaramil at wag.caltech.edu].